Myself and 2 friends arranged a taxi from our resort (Barcelo Solymar) into Old Havana, it was 100 CUC total for the trip. Our driver spoke broken English but was at pointing out sites on the way. 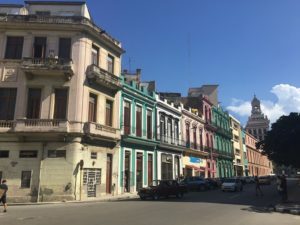 The drive was just over 2 hours arriving into Old Havana at the Plaza de San Francisco. We toured Old Havana for the rest of the morning, the architecture and colour of the buildings was really interesting. In the afternoon we visited 2 museums to escape the afternoon heat. All descriptions were in Spanish but overall the museums were interesting to visit. Mueso de la Ciudad – City Museum formerly the Governor’s Palace. It has old war uniforms, cannons, guns and rooms decorated with art and original furnishings.Very beautiful building with gardens and peacocks in the courtyard. Entrance fee is 5 CUC. Castillo de la Real Fuerza – Which is the star shaped fort on the west side of the harbour, located close to Plaza de Armas. It now hold the Navigation Museum with model ships from Cuban history and treasure from sunken galleons.If you tip the security guard they may even let you climb the bell tower for amazing views of the city and harbour! Entrance fee is 5 CUC. Our guest house, Casa Novo, was in Centro Havana about a 30 minute walk from Old Havana, it was very nice home and the hosts were amazing,it was perfect for what we needed. 45 CUC for en suite room and breakfast for 3 people. We were able to walk to the Malecon (waterfront) and watch a beautiful sunset. After heading back into Old Havana we found a restaurant with band and dancers, we enjoyed a cold beer while watching the amazing show. We enjoyed a delicious dinner at La Imprenta in Old Havana, it was very reasonably priced with great food. The restaurant has a great atmosphere with pianist and gardens in a central courtyard. 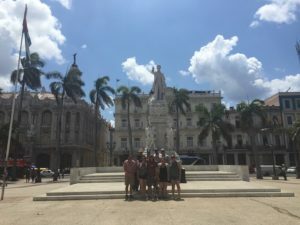 The next morning, after a wonderful breakfast at Casa Novo, we headed back to Old Havana to meet up with the rest of our group. 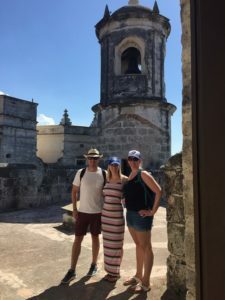 They had traveled from Varadero that morning to do a day trip into Havana. We also saw the remains of the old city wall, Hemingway’s favourite hotel and bar, and the iconic Havana Cathedral. 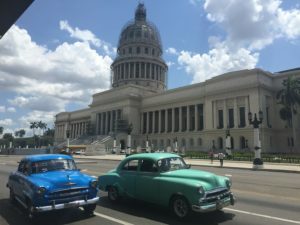 We left old Havana made our way to Parque Central and saw the El Capitolio (It is modeled after the US Capitol Building in Washington DC) They are doing extensive building renovations so you are not allowed to tour it at this time. This part of Havana was modeled after New York City with Central Park and Plaza Hotel. Across the road you will see the Gran Teatro (Great Theater) which shows Cuban music and dance. And in the park is a statue for Jose Marti where we stopped to take a group photo. After leaving old Havana, we stopped at a cigar factory store, tourists aren’t allowed into the factory any longer. They fear that the staff will try to sell cigars they are rolling to tourists for a lower price. The store had great rates on a nice selection of rum, coffee and cigars. 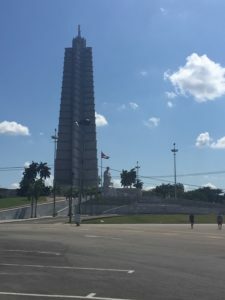 Our last stop in Havana was the Plaza de la Revolucion where you see the Jose Marti Memorial, the tower stands 109m above the plaza. As you look around the square, you see steel memorials to Che Guevara and Camilo Cienfuegos on important government building. The Teatro Nacional de Cuba (National Theater of Cuba) is also located here. On our way back to Varadero we stopped at a beautiful lookout spot, it was high on a hill and overlooked the beautifully steep valley below. A wonderful place to enjoy a cold cerveza before returning to your resort.